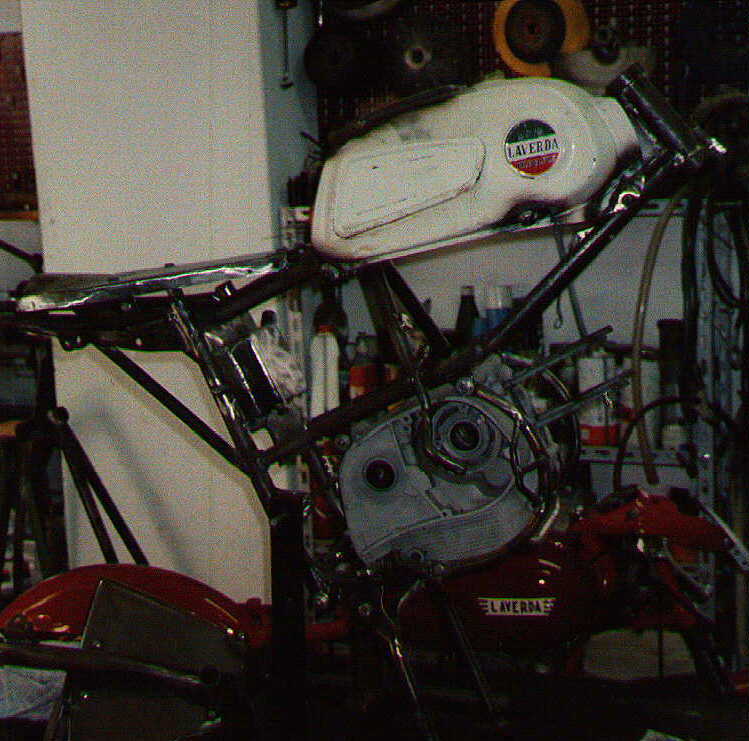 NOTE: All of the Laverda 150s were "excessed" in late 2005 when I had a big clear-out of "projects that were too far down the priority list to be likely to ever be started". Yesterday saw the addition of several more small Italian orphans to Michael's Home for Wayward Motorcycles. The latest arrivals are two 150cc Laverda pushrod four-stroke single engines. These have nearly horizontal cylinders, and at $120 the pair I couldn't control my acquisitive urges. 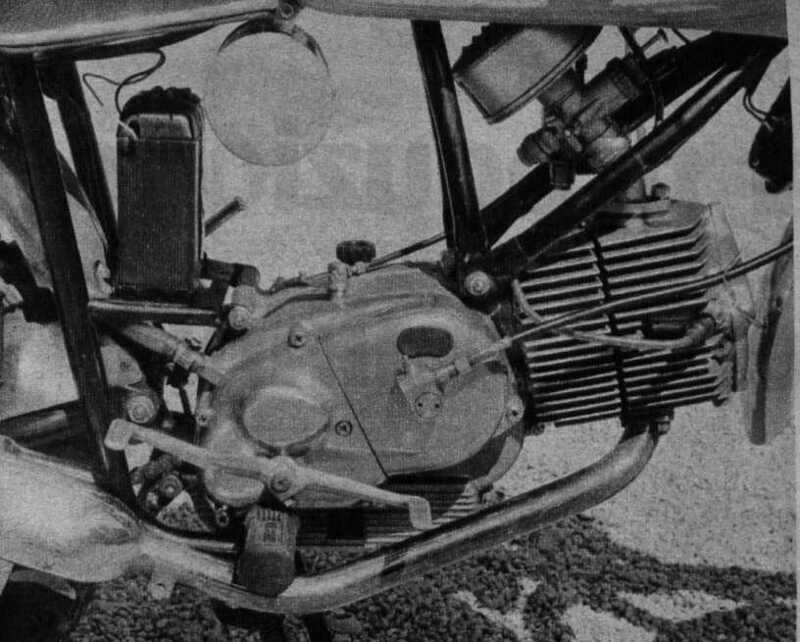 The Laverda was originally developed in 1965 as a 125 with 56mm x 50mm bore and stroke. Both Sport and Trail versions were made. The 150 was made shortly thereafter for the American market. 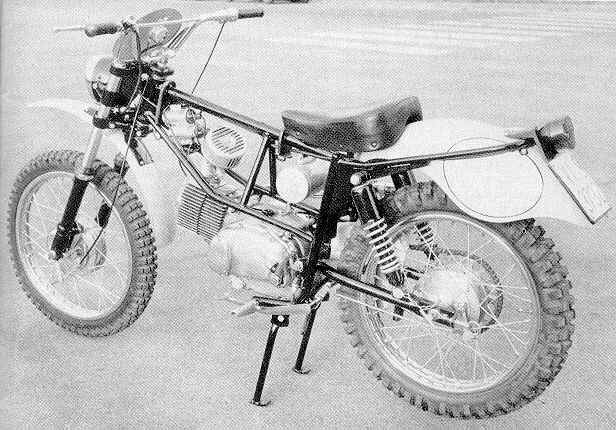 At the Milan show of 1967 a competition version of the Trail, the Regolarita Corsa, was introduced. In the 1968 ISDT Laverdas took one gold and two silver medals as part as the victorious Italian Silver Vase team. I think that I'll use these engines to build an AHRMA Classic 125 motocrosser, as the four-stroke singles are allowed to run at 150cc in this class, and it takes in the earlier pre-Honda Elsinore motorcross bikes. As always - let me know if you run across manuals, road tests, engine parts, etc. 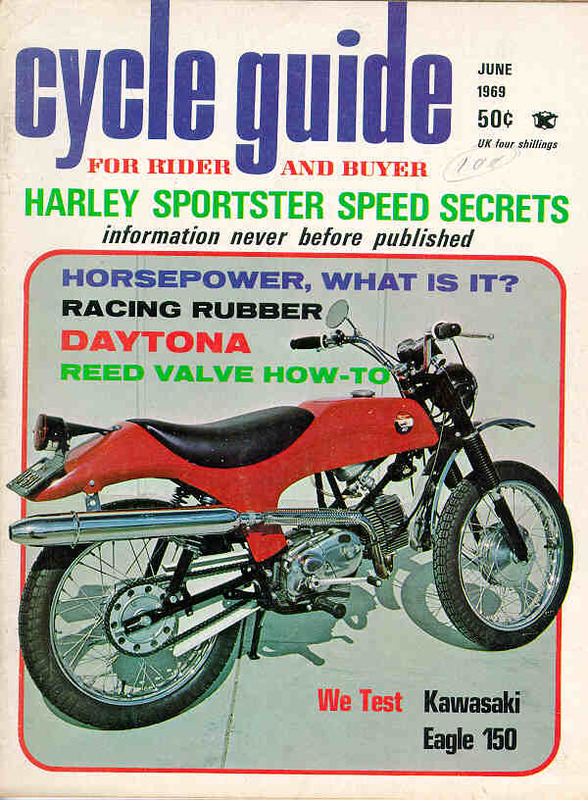 The Laverda timing and lift is similar to the Megacycle hot-rod cam for the 70cc Honda - not too wonderful for an engine with twice the displacement! 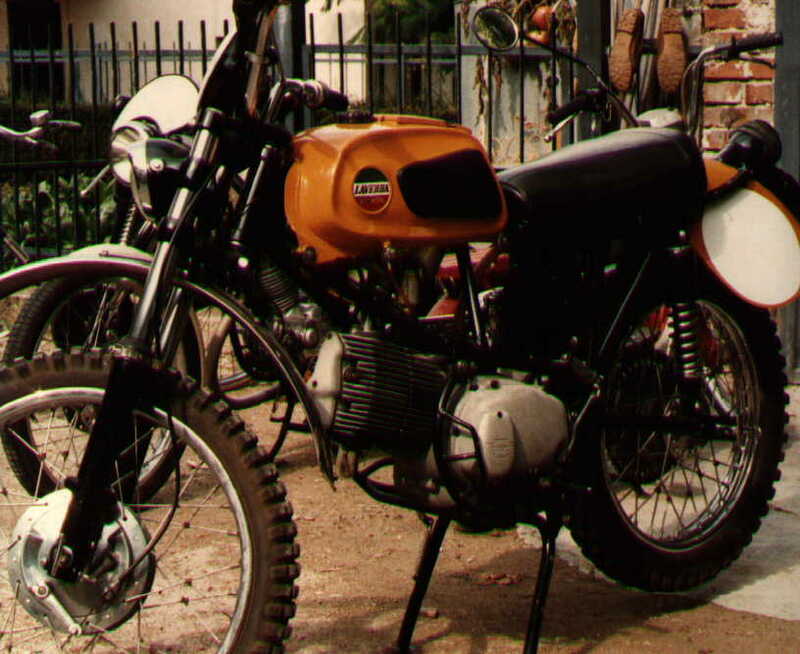 The Laverda 125 Regolarita Corsa which indeed was used for the 6 days are rare birds. I know the existence of only one and it is in the hands of former works chief mechanic Nino Caretta. A few years ago he built an exact replica of the bike which was still in his posession the last time I met him and it was featured in the Italian classic bikes magazine 'Legend Bike'. 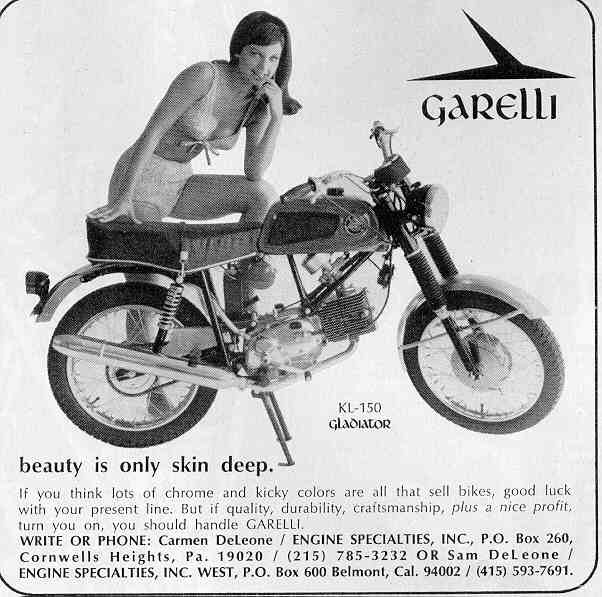 At first sight the Corsa looks very similar to the Garelli Gladiator you have on your home page, (more or less) similar frame, same tank but single seat tiny headlight, high exhaust with megaphone, high front mudguard and a beautiful shaped rear mudguard which at the same time functions as an area to fit start numbers. The bikes were painted in yellowish 'mustard' colour. Inside the engine the was a hot cam, high compression piston and everything lightened, polished or reinforced for racing. He showed me many of the special parts but I'm afraid I don't have any hard figures. I may be able to dig up some specs though. I did take some pictures of the bike so I can scan it and e-mail it to you (when my computer at home is repaired...). Nino showed me the bikes when I interviewed him for the book '750 SFC' and duplicated some of the pictures from his shoe box which he kindly let me use for the book. Nino fired the bike up and sent his son off up the mountain road next to his house. Seeing him fly off the hill (of course without helmet) was quite a sight and sound! 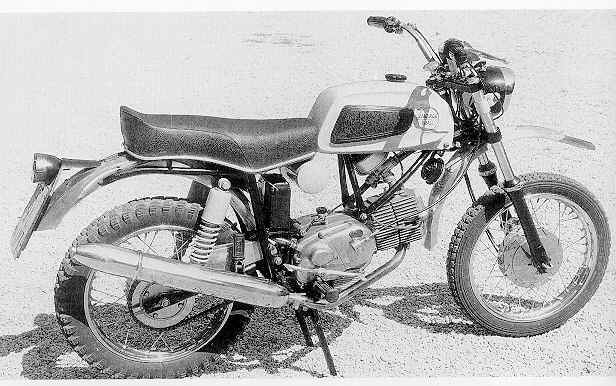 This is a real lively and fast engine compared to the standard 125s which had a bit lazy, un-inspiring engines. By the way, the same show was performed on an ex Milano Taranto 75 cc Laverda race bike, also equiped with a fabulous tiny magaphone. What a noise and remarkable speed from such a tiny engine. 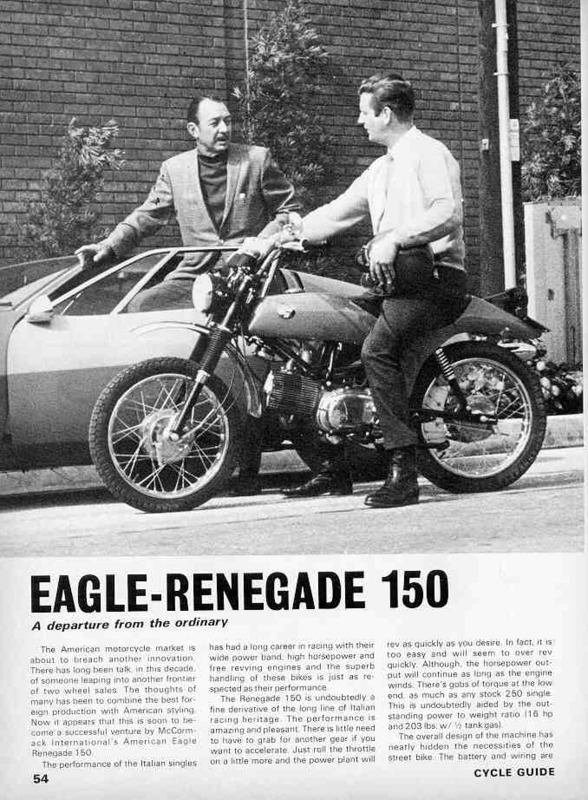 I don't know how the 150 cc American Eagle Renegades performed. Never saw one 'in the flesh 'and never saw a test report. 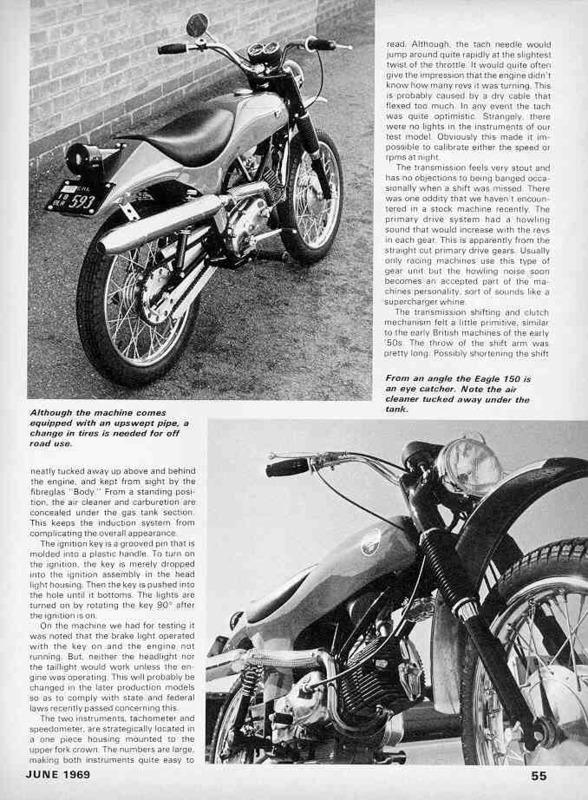 Here is some rather extensive technical information about the 125 Laverda 'Sport' which I found in Motociclismo magazine, surely some of the data will be of use for you, particularly the light bulbs section, enjoy! results in max advance at 37 - 39 degrees. Fuel consumption: 1 litre per 40 km. Total distance approx 460 km with its 11,5 litre tank.. Speed: 36,5 kmh in first, 67 in second, 97 in third and 120 in fourth gear. 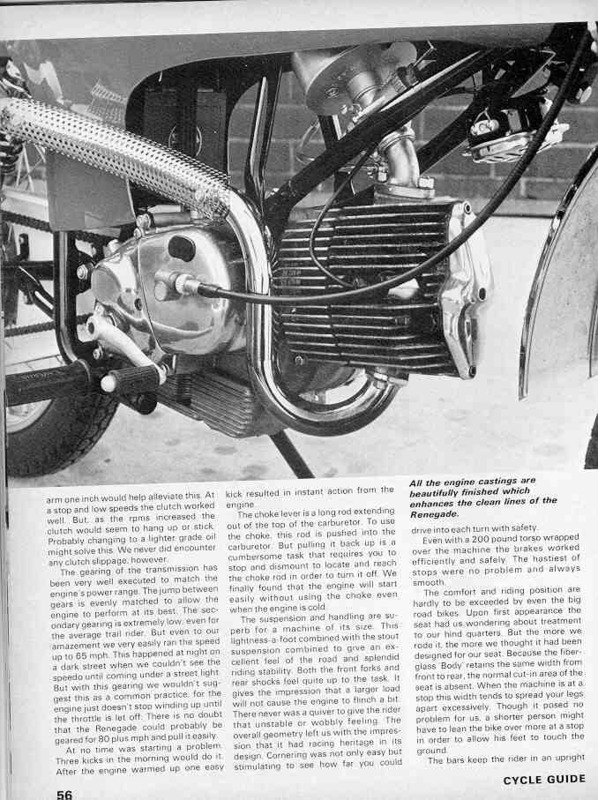 Motociclismo magazine writes some time later that the engine of the trail version was identical but had a 22 mm UB 22 BS with main jet 93, rest same as above. 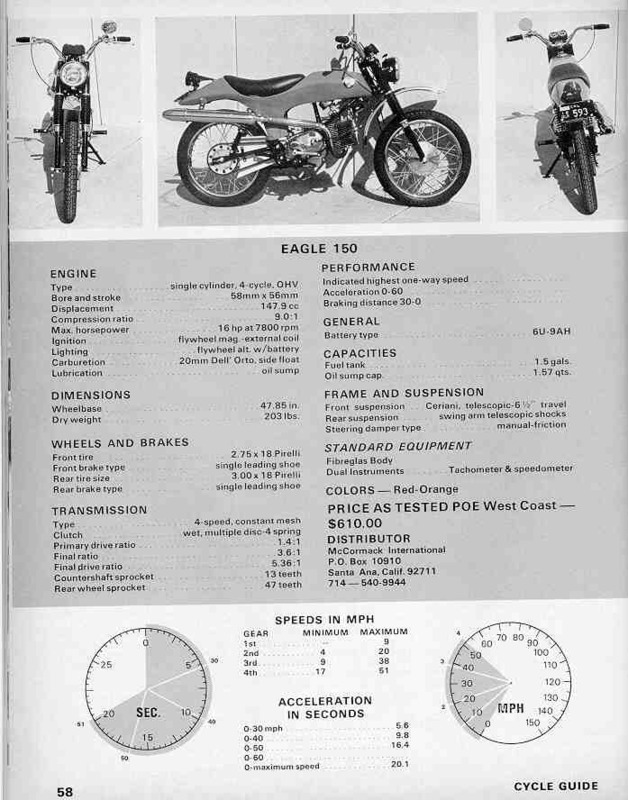 It had a 47 rear sprocket which resulted in 29 kmh in first, 56 in second, 81 in third and 100 in fourth gear. With the 8,5 litre tank it would still bring you 340 km far. Seems strange that other sources claim that it was a 20 mm also, but that the 22 was on the 'RC' version. Some more digging needed! 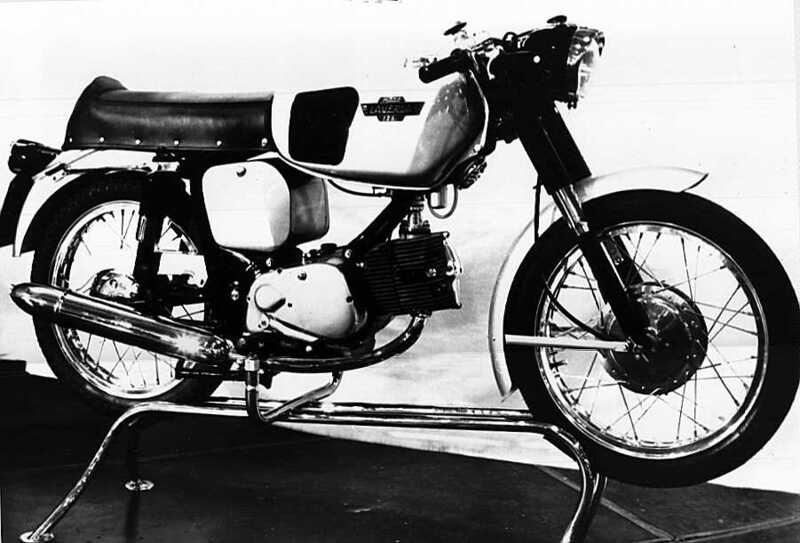 Announced at the 1967 Milan Show, and now being delivered, the Laverda Regolarita Corsa (Competition Trial) is a truly businesslike machine. This motorcycle is very carefully built in batches of 30 units. These are sold with various rear sprockets, and a silencer for street use, instead of the noisy competition trumpet. One of the most expert Italian trialists, 1966 national champion Luigi Gorini, spent last season riding and improving the bike and next season he will be backed with the same target, by another excellent rider, 1967 national champion Edoardo Dossena. Unusual features of this new Laverda are the sturdy, double upper cradle tubular frame, with the engine hanging under it, and the horizontal light alloy cylinder which provides better cooling, which is particularly needed in the rough. The center of gravity is much lower. Mudguards and easily detachable 2.25-gal. fuel tank are fabricated of robust fiberglass. Ceriani competition suspension, adjustable at the rear, and 2.75-19 front and 3.50-18 rear tires are fitted. Weight is 205 pounds. The pushrod, 56mm by 50mm bore and stroke engine delivers 12 bhp at 9000 rpm to the rear wheel through a well-spaced, smooth four-speed gearbox. (A five-speed unit will be available soon.) 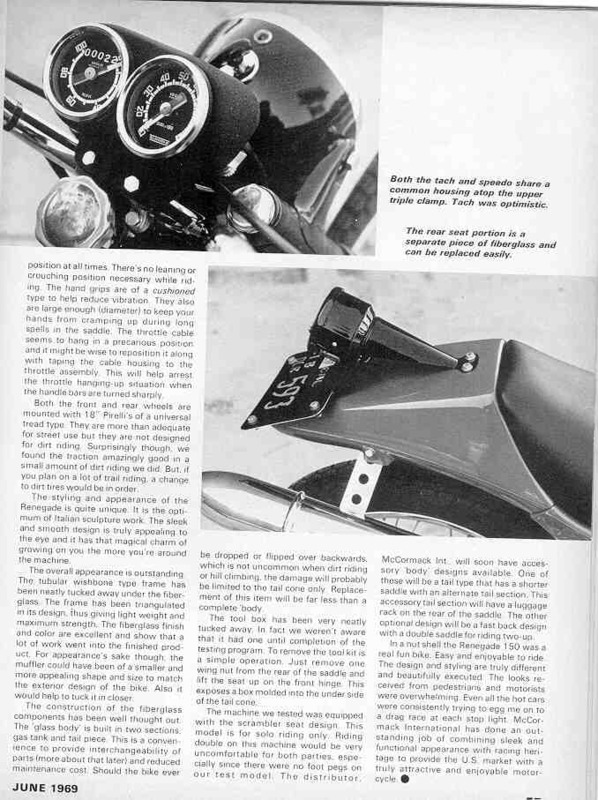 Fed by a 22mm carburetor, the 10.7:1 compression ratio engine pulls vigorously from low rpm. The crankshaft carries a flywheel alternator, at the right, while the breaker points are found on the opposite side, actuated by the camshaft end. The primary drive gears, the oil pump drive and the multiplate clutch also are on the left. Another quality of this machine is ease of handling. Thus even a beginner can tackle with confidence off-the-road obstacles. Another feature which instills a feeling of security is the braking effect of the four-stroke engine during the steepest of downhill runs. Top speed is a shade over 62 mph. The factory 125/150 frames, whether Sport, Trail or Regolarita Corsa, have some pretty odd design features. If you look at the RC frame you'll notice that the downtubes from the bottom of the steering head bend about 4" in front of the front upper motor mount, and the vertical bracing tube comes into the frame member about the same distance behind the motor mount. I'll run the down tube and the triangulating tube straight to the motor mount (more like the 150 Trail frame). There is a single top tube that makes a "T" intersection with a tube that runs across the frame in front of the upper shock mounts (this also attaches to the vertical tubes that go down to the swing arm pivot). I'd prefer to have a tetrahedronal structure of tubes coming off the steering head and back towards the seat, picking up the triangulating tubes from the motor mounts. This should make for a much more rigid structure, and it should still be quite light. Since I plan on having a 54-55" wheelbase the swingarm will be extended a fair amount, and the dampers will move back along with the rear axle at that time. I haven't figured out yet how to modify the picture in Photopaint to show that, but the tube from the bottom rear motor mount will be more diagonal, slanting to the rear of the bike, than the near vertical tube that is in the stock frames. 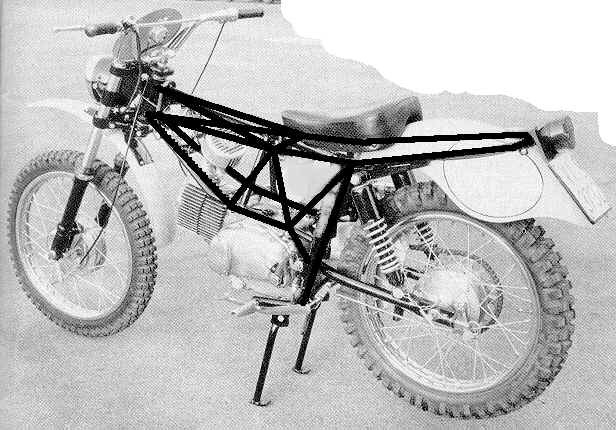 The long rear fender loop on the stock frame looks pretty easily bent in a crash, but it should have less unsupported length once the dampers are moved back. If anyone needs a service/parts manual for the 125/150 you can find one here on my website. That is about 2.8M in size.